I’m not a crime-thriller sort of reader and find them to be generally fairly formulaic; but having devoured Gerard Brennan’s ‘Wee Rockets’ and ‘Wee Danny’ back to back, I picked up Undercover, confident that Brennan’s writing would see me through. 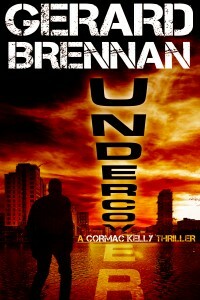 Pacey, smart and entirely driven by Brennan’s skilful narrative style and insightful characterisation, Undercover has more heart than a butcher’s window and the makings of a great series of novels in its main Character, Cormac Kelly. Harbouring none of the clichéd mannerisms, foibles or ghosts of his pulp-noir peers, Kelly (whilst engaging and very much the focus of the story) is used (wisely) sparingly at times by Brenan, who carefully switches narrative perspective and allows his story’s ‘victims’ to come to the fore. This allows the potentially minor characters to show all their own strengths and weaknesses and truly affect the outcome of the relentless tale. Each is given time to develop and show their courage and cowardice, fears and strengths; and drive Kelly through the narrative. Lydia, Rory, and young Mattie are all given central roles in the story and fully-fleshed characters. The ‘supporting cast’ are very much driving Kelly through their world, rather than being utilized as mechanisms for placing Kelly in various perils. I found this refreshing. I’m a convert to Brennan’s style of crime novel and can’t recommend this book highly enough. You can find Gerard Brennan and his books at Amazon, US and UK. Undercover is published by Blasted Heath. This entry was posted in book review, books, crime novel, literature, media, news, popular culture, writing and tagged Blasted Heath, Crime fiction, gerard brennan, Mark Wilson, Review, Undercover by MW. Bookmark the permalink. Reblogged this on Team Indie Blog.